It’s no secret that Melbourne boutique hip hop label Crate Cartel have been putting out some of the purist hip hop music in Australia for years now. Having the deepest respect for the genre’s roots, the Cartel is conscientiously on point when adhering to age-old principals and legacies. None demonstrates this dedication to the movement more than Fluent Form, possessing all the background knowledge, experience and sensitivity required. 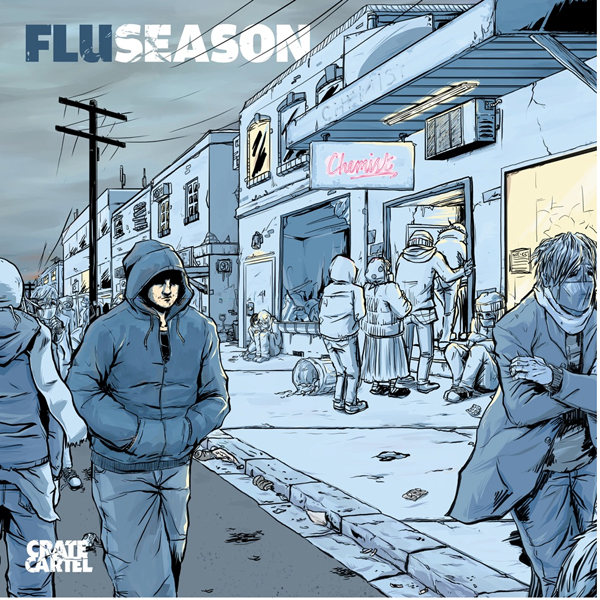 Flu is the A-grade emcee, and what he has produced with new album Flu Season is no less than top-shelf hip hop. Ever the contrarian, upon every listen Flu’s cryptic word play uncovers truth after truth for those who choose to hear it. Lyrical themes range from braggadocio tracks, displaying wordplay at its very best, to highly creative conceptual tracks, which seek to examine the world outside of first person. Guests on the album include Geko, Pang Production’s 1/6, Mata & Must, as well as American cohorts One Be Lo and Has-Lo, while production credits go to Must Volkoff, Geko, Discourse and L’Orange. Second track on the album ‘Ironclad’ epitomises Flu’s new formula for writing with its laid back production by Must Volkoff paired with abstract lyricism. The layers of metaphor and double entendre designed to reward ‘true’ Flu fans. With production by Crate Cartel’s Discourse, ‘Synthetic Love’ is a conceptual gem. Taking on the persona of ‘addiction’ in the first verse, Flu explores the subject and its effects often drawing on his own experiences. The second verse sees Fluent Form as himself, changing his thought patterns, using honest reflection as a way of ultimately defeating his nemesis. Perhaps the most personally generous track on the album, ‘Fan Mail’ is written from the perspective of Flu’s inner critic. Melancholic piano samples trademark the production by Geko, perfectly indicative of the desolate subject matter. “You fought the good fight, but it’s time to leave”. An album for those who appreciate a philosophical outlook and a cryptic unravelling, Flu Season is a masterful piece of work from start to finish. Pre-order Flu Season from JB Hi-Fi here.